in service operations can be divided into two major categories: front-of-the-house and backof the-house. Front-of-the-house workers are defined as those who have direct contact with the customer. Examples would include a teller at a bank, a cashier at a discount department store. or the check-in personnel at an airline counter. Back-of-the-house workers are those workers who do not interact directly with the customers. Examples here would include a cook in a restaurant and a baggage handler for an airline. (The scheduling of back-of-the-house workers is usually very similar to scheduling workers in a manufacturing environment.) A necessary element in the conversion of customer demand into front-of-the-house worker requirements is the establishment of a customer-service level. For example, many restaurants offer express lunches within a specified time period. Another example of a specified level of service is at Putnam Investments in Andover, Massachusetts, where Liam McMakin states that Putnam's established service level at its call centers is that "93 percent of all calls should be answered in 20 seconds or less."? Knowing the average number of customers who require service in a given period of time and the average length of time it takes to provide service to each customer, a manager can determine how many workers to schedule for that time period in order to provide the desired level of service. Queuing theory. which was presented in the previous chapter, is a mathematically organized approach for establishing the relationship among the three following variables: (,I) customer demand (for example. customers per hour); (b) available capacity, expressed in the number of workers on duty and the average time to service a customer: and (c) average customer waiting time. To facilitate this process of converting customer demand into a specific number of workers. 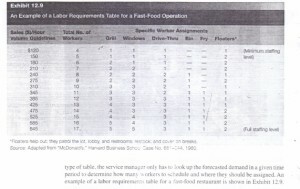 a service organization often will develop a labor requirements table. 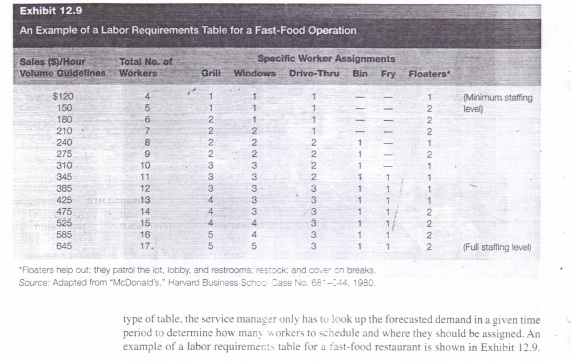 This table the manager h many workers are needed for different levels of demand. For some companies, these table also will indicate where these workers should be assigned. With this. type of table, the service manager only has to look up the forecasted demand in a given time period to determine how man) workers to ~.nedule and where they should be assigned. An example of a labor requirement. table for a fast-food restaurant is shown in Exhibit 12.9.